King's Norton probably had a workhouse from around 1729. From 1803, a building at the south side of The Green was used a workhouse for the parish. King's Norton parish workhouse on The Green. In 1776, a parish workhouse was operating in Beoley for up to 10 inmates. 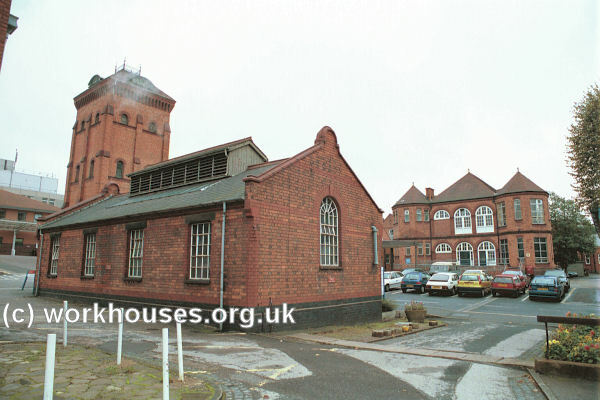 Harborne had a workhouse on Lordswood Road near its junction with Gillhurst Road. 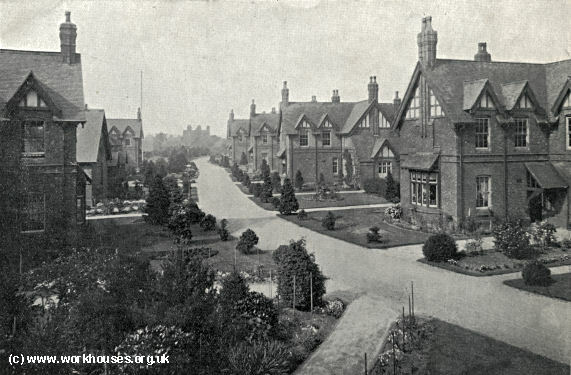 Edgbaston owned a poorhouse and gardens on Harrison Road, near the junction with Somerset Road. Northfield had a small workhouse from around 1801. It was located on the Bristol Road, between the Bell Inn and what was then Ash Bank Farm. The institution had a garden where potatoes and cabbages were grown. The inmates were employed in making nails. The building survived until the 1950s. County of Worcester: Beoley (2), King's Norton (5), Northfield (3). County of Stafford: Harborne and Smethwick (5). County of Warwick: Edgbaston (5). The population falling within the Union at the 1831 census had been 14,701 with parishes ranging in size from Beoley (population 673) to Harborne and Smethwick (4,227). The average annual poor-rate expenditure for the period 1834-6 had been £4,845 or 6s.7d. per head of the population. 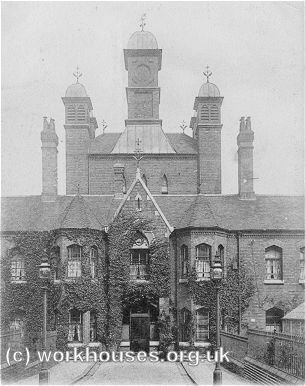 Initially, King's Norton Union took over the existing parish workhouse on The Green. In 1837, the Poor Law Commissioners authorised an expenditure of £1,500 for the alteration and enlargement of the old buildings, which in 1841 housed 102 inmates. 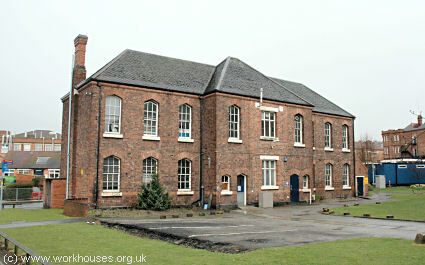 The Harborne workhouse also remained in use for a period. After its closure the building became a manufactory for washing-powder. 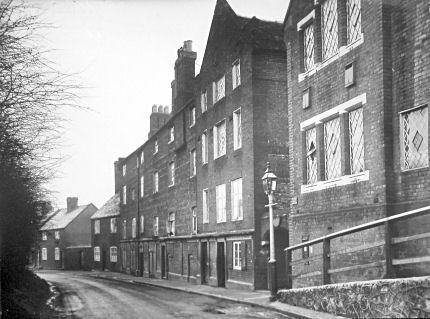 In 1870, a new workhouse was erected at the north side of Raddlebarn Road (formerly called Workhouse Lane). 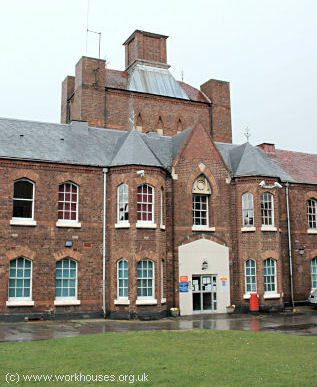 It was designed by Edward Holmes who was also the architect of the Foleshill Union workhouse in Coventry. Its location and layout are shown on the 1903 map below. King's Norton workhouse site, 1903. King's Norton original entrance building from the west, 2000. The main accommodation block had a T-shaped corridor-plan layout. King's Norton main block from the west, 2000. An impressive tower, now somewhat truncated, rose above the centre of the building. King's Norton main block from the south-west, c.1910. King's Norton main block from the south-west, 2000. 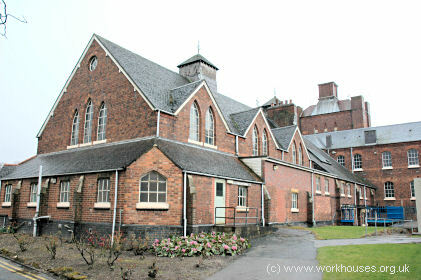 The rear wing of the main block contained the workhouse kitchen and dining hall. King's Norton rear of main block from the north, 2000. 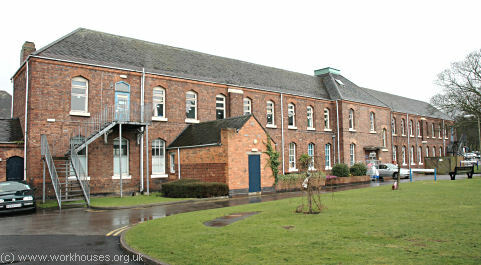 At the rear of the workhouse were two pavilion blocks, originally connected by corridors to the main building. 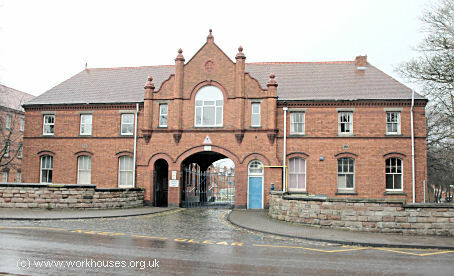 The block at the north may have been the workhouse school, and that at the east the original infirmary. King's Norton north pavilion, 2000. A small building to the rear of the eastern pavilion was probably an isolation block. King's Norton isolation block?, 2000. In 1897, a pavilion-plan infirmary was erected at the south-east of the workhouse. King's Norton infirmary from the south-west, c.1910. King's Norton infirmary from the south-west, 2000. King's Norton infirmary boiler house and water tower, 2000. 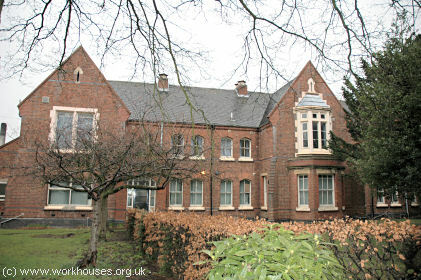 SELLY OAK.—The new workhouse infirmary adjoining the workhouse at Selly Oak, just built for the King's Norton Board of Guardians, was formally opened on Saturday. The land slopes from east to west about 11ft., an inclination which has been taken advantage of in the planning of the pavilions, of which there are four, with sufficient space for an extension of another four. The administrative department is in the centre, with the laundry, boiler-house, engine-house, dynamo-rooms, and water-tower at the rear, the whole covering an area of about six acres. The buildings have been erected by Mr. Thomas Rowbotham, Small Heath, from the designs of Mr. Daniel Arkell. A departure has been made from the generally acknowledged workhouse style, the principle adopted being to make the different rooms light and cheerful for the patients, and the surroundings pleasant and agreeable for those who have to attend on them. Externally the buildings are of red brick, relieved by dark-red coloured bricks and terracotta strings, the roofs being covered with bright-red Broseley tiles. The style is a free treatment of Renaissance. Accommodation is provided for about 300 beds for patients and officials, whilst provision has been made for a future extension of a similar number. In the centre are the one-story kitchen block and administrative buildings, which are connected to the building by covered ways. The doctors' rooms, nurses' general sitting-room, sewing-rooms, matron's-rooms, steward's stores, dispensary, telephone-exchange room, and nurses' and servants' residences are in the centre and under the supervision of the matron, with lavatories, bathrooms, &c., complete. The cooking kitchen, sculleries, pantries, stores, &c., are at the rear of the administrative block, centrally placed. Adjoining the central block, and off the main corridor, are placed the receiving wards for male and female patients. The pavilions are axially arranged nearly north and south, with fire and sound proof floors. There is no direct internal communication between them, the upper floors being reached by an external staircase, opening from the staircase. A long wide corridor leads left and right to the different rooms, which comprise eight wards for 24 beds each, eight wards for five beds each, and eight wards for two beds each for special cases. The large wards are overlooked from the nurses' duty rooms and kitchens by a small window. The labour wards are provided for five beds each, and two separate wards of one bed each at the end of the north female pavilion, to be used for maternity cases, these wards being cut off from the main pavilion by corridors. Two large wards are lighted by means of windows on either side; all angles and corners are rounded, and the whole of the floors are of marble mosaic. Access and egress fireproof staircases are provided to each block, and balconies at each end of the pavilions for the use of convalescent patients. The male and female pavilions on the first floor are connected with the official block by a wide open asphalte roadway, which forms the roof of the corridor beneath. It was originally intended to heat the new building from the workhouse boilers; but, in consequence of the Local Government Board's requirements, the guardians have built a boiler-house, engine. house, dynamo-rooms, laundries, and water-tower at the rear of the new building, together with three large boilers and a tank in the water tower. Adjoining the boiler-house are coal stores. Near to a high chimney-shaft is the engine and dynamo-room, in which are placed powerful steam-engines to create the electric supply for lighting the whole of the rooms in the infirmary, and also the arc lamps to illuminate the grounds at night. No gas-pipes are laid in any portion of the building, which is entirely dependent on the electric light, there being sufficient storage in the accumulator-house for one night's supply. The total cost of the infirmary has been £45,000. In 1902, the workhouse buildings were extended to the west with a new entrance block, ward block, clothes store, sewing room, and wood-chopping shed. King's Norton 1902 entrance block from the south, 2000. King's Norton 1902 foundation stone, 2000. The new three-storey ward block at the far west of the site increased the workhouse accommodation by 1,000! King's Norton 1902 ward block from the east, 2000. In 1908, a large nurses' home known as Woodlands was erected at the south of the workhouse. 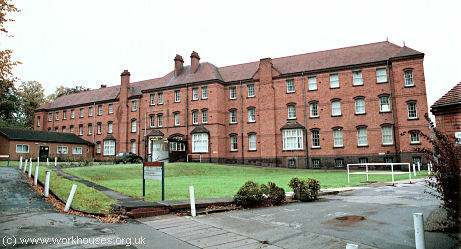 King's Norton nurses' home, 2000. 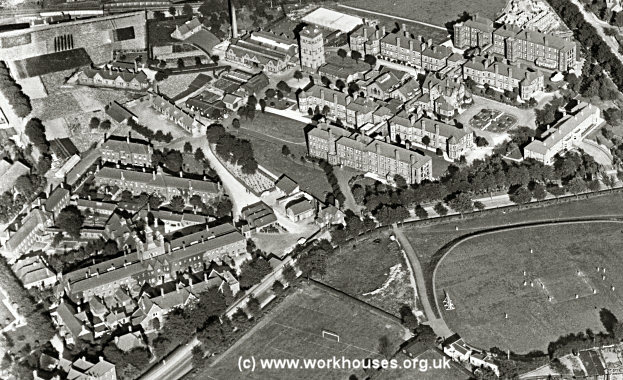 Aerial view of King's Norton workhouse and infirmary, 1920s. 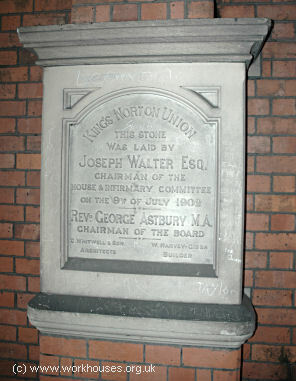 Following boundary changes in 1911, King's Norton Union was amalgamated with the Birmingham and Aston unions to create an enlarged Birmingham Union. 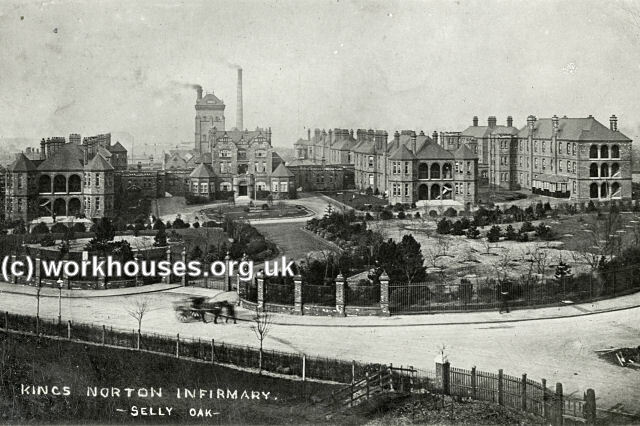 From 1928, the site became known as Selly Oak Infirmary, although the workhouse and infirmary continued to operate as separate sections. 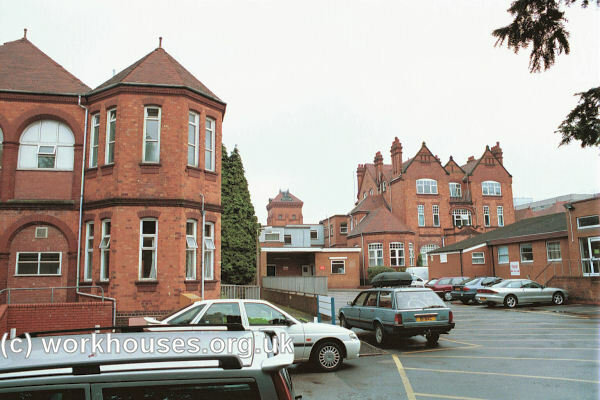 In more recent times, the site was known as Selly Oak Hospital until its closure in October 2011. The site has now been redeveloped for housing, with demolition of the old hospital buildings. As well as the workhouse, King's Norton Union operated a cottage homes site on Woodcock Hill at Shenley Fields. Cottage homes provided accommodation and training for pauper children away from the workhouse, usually in semi-rural locations. Children were housed in cottages each holding 20-30 boys or girls and supervised by a house "parent". Erected in the 1880s, and extended in 1893, the King's Norton Cottage Homes site eventually included eleven cottages, a school, swimming bath, a hospital, workshops, etc. Its location and layout are shown on the 1916 map below. 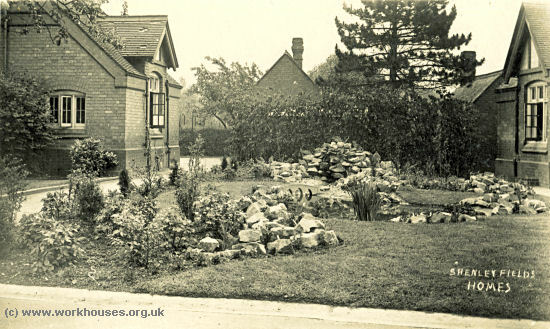 King's Norton cottage homes site, 1937. Shenley Fields cottage homes, c.1905. After the Second World War, the individual homes on the site were given the names: Ferndale (later called Cherry Garth), Rose Cottage (later Suncrest), Rosemead, Jasmine, Merriland, Greenways, Lilac View, Melplash, The Trees, Ryedale and Elmdene. The homes' entrance lodge was named Shangri La, and a stores building became known as The Office. The original infirmary was named Pinewood. Elmdene was originally the probationary home, used to house new arrivals, but this role was later taken on by The Trees. 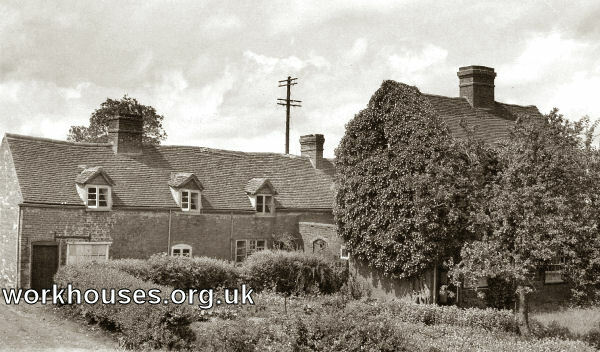 An additional house was erected in around 1935 to accommodate the then Matron, Miss Parry Jones. In 1982, following a decline in demand for places at the homes, a gradual process of closure was begun. In 1987, the last house remaining in use, Pinewood, was closed. The site was then disposed of and is now occupied by modern housing. 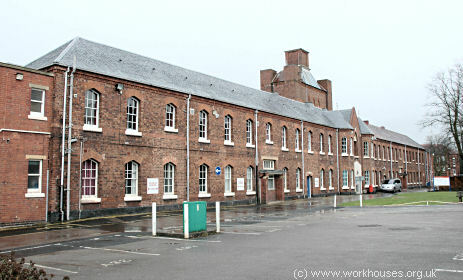 Northfield workhouse: Register of inmates (1830-37); General accounts (1801-34); Clothing accounts (1828-35). Relatively few union records survive — holdings include: Guardians' minute books (1836-1912); Cottage Home registers (1887-1924); etc. Plumley, Jill (1992) The Children's Homes Village. One Hundred Years of Memories of the Shenley Fields Cottage Homes.